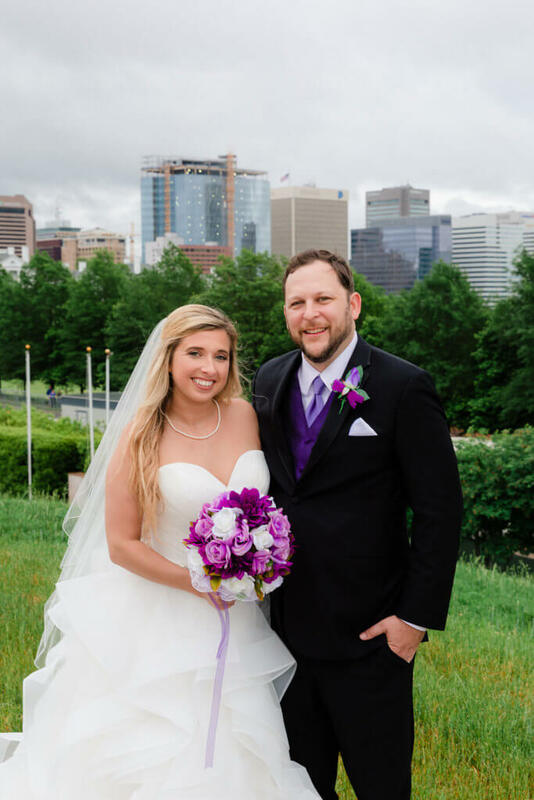 Chantel and Jake first met in 2014 at Jake’s restaurant, Lady N’awlins. 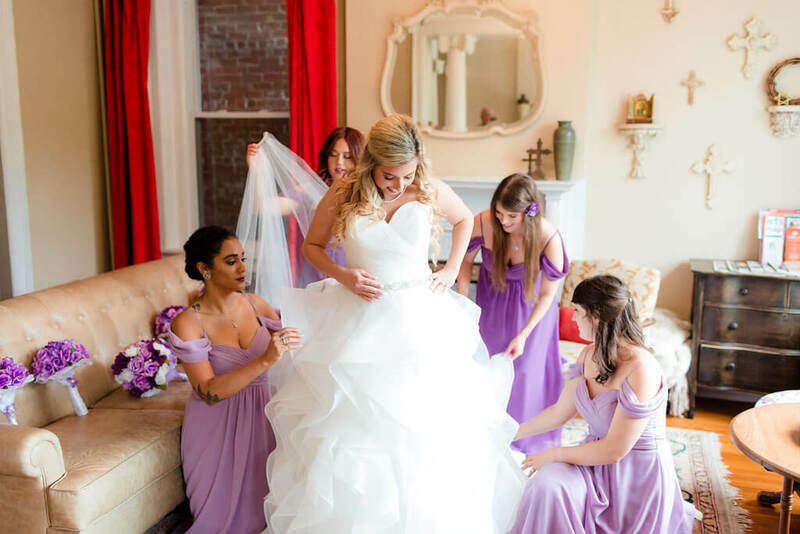 But it wasn’t until a year later during a friends trip to New Orleans that they really hit it off. 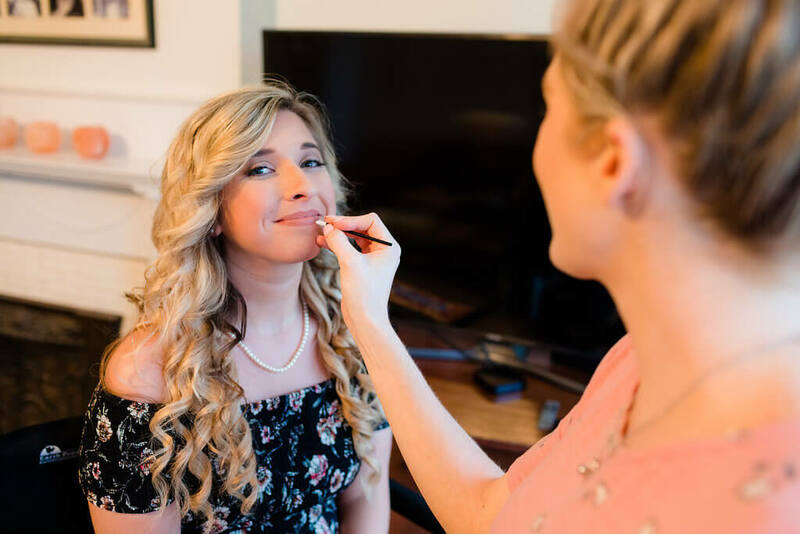 Chantel explains, “We all met up at this great venue called Tipatinas, where our friend was performing.” They ended up losing a few people in their group because the show had started so late, but Jake and Chantel stayed until the end, dancing away the night. 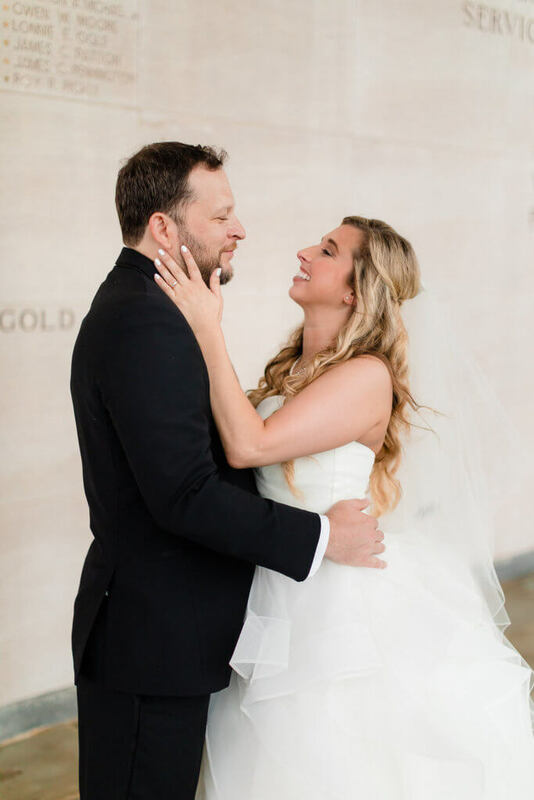 “It was such an amazing time and at that moment I knew how much I cared for this man, I was completely head over heels.” From that trip on, the two were attached at the hip, falling more and more in love every day. 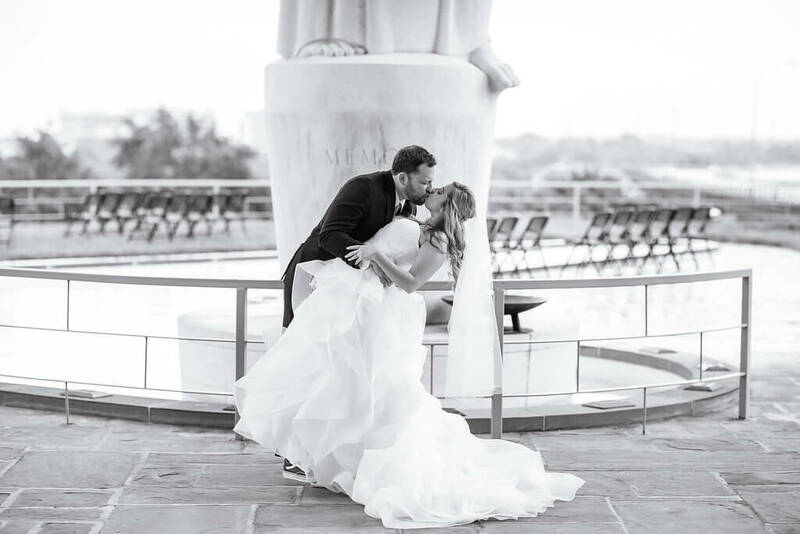 Jake asked Chantel to spend the rest of his life with him in New Orleans two years later. 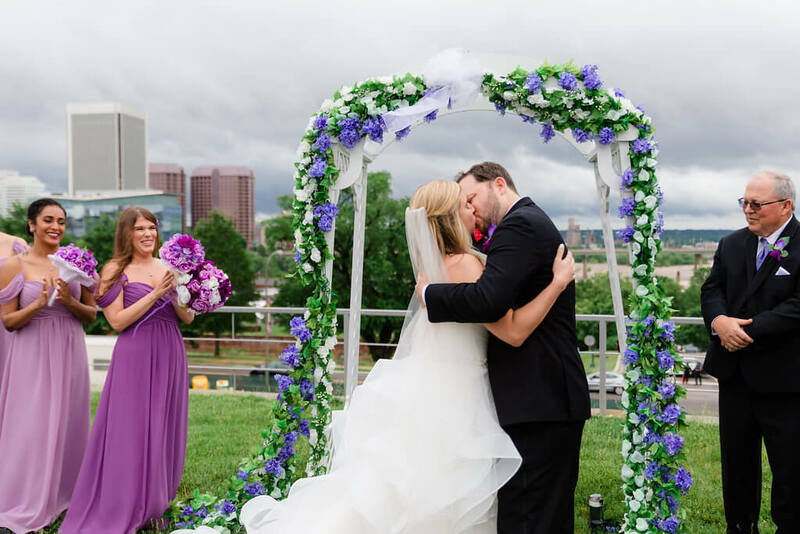 Chantel had absolutely no idea the proposal was coming, but Jake had been planning it for months. 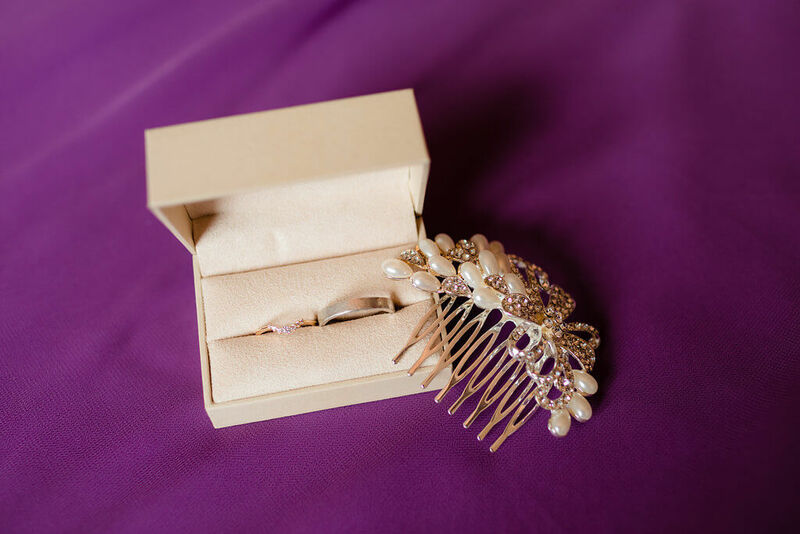 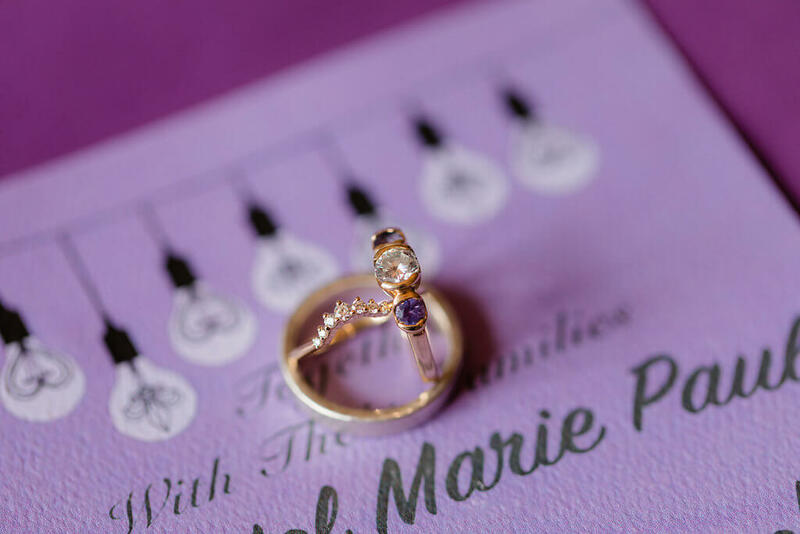 Before their trip, he’d been to Nine Roses in Carytown multiple times, designing a ring perfect for Chantel. 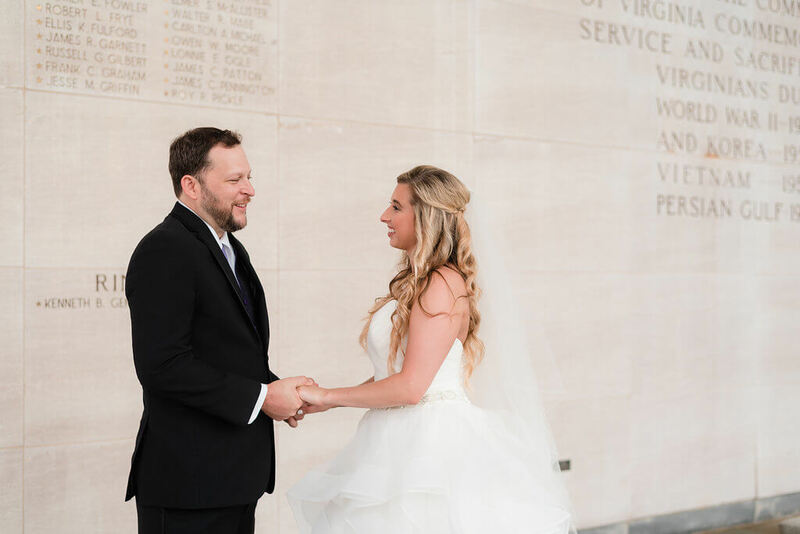 The two usually drove down to New Orleans, taking mini trips along the 18-hour-drive, but this time they decided to fly. 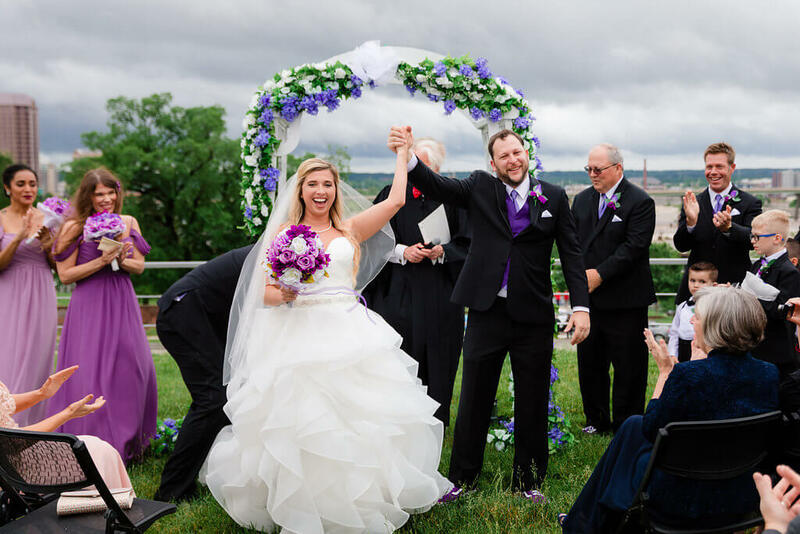 “Jake insisted on carrying his own bag on the plane, and I was like okay weirdo…” Once they got to The Big Easy it was pouring rain, and storming all night. 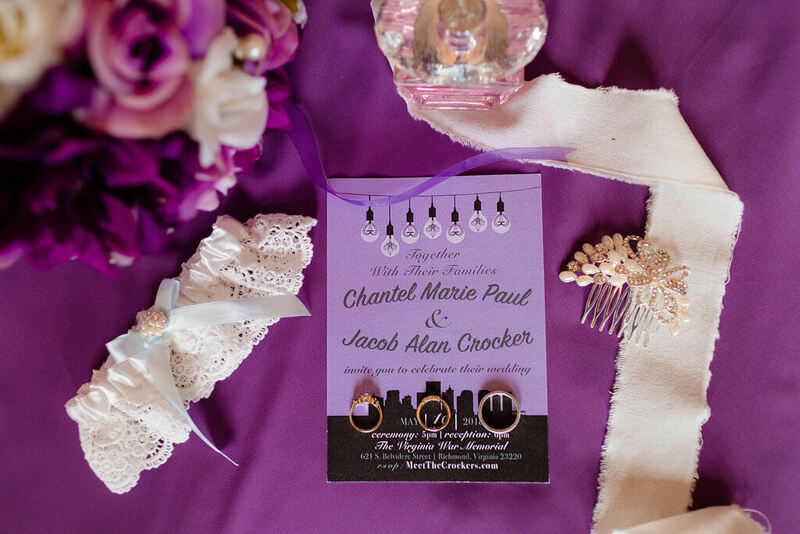 Unbeknownst to Chantel, Jake ended up changing the time and location of the proposal multiple times. 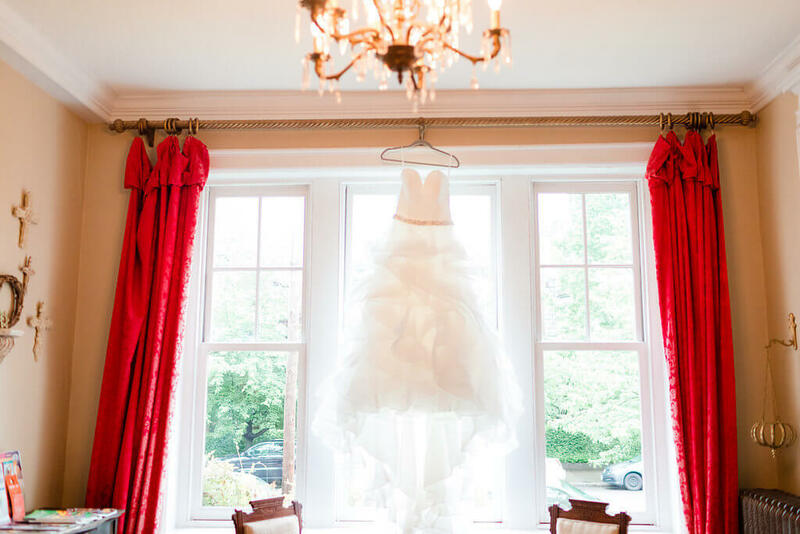 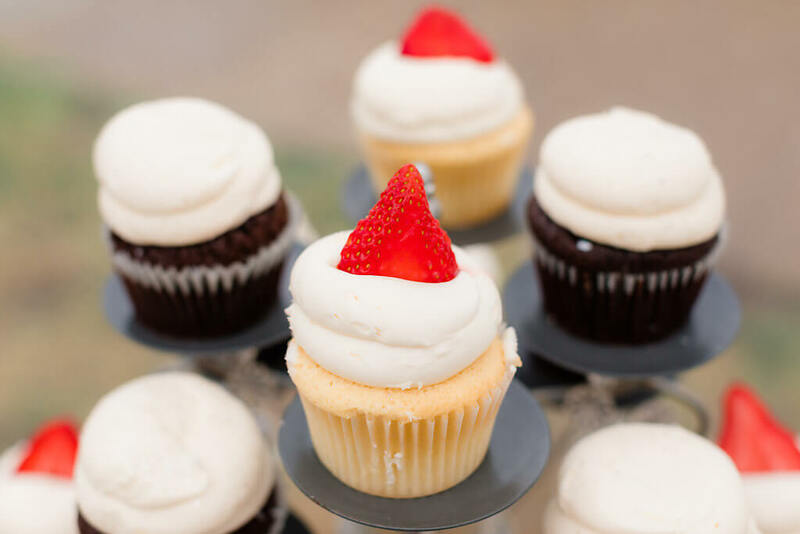 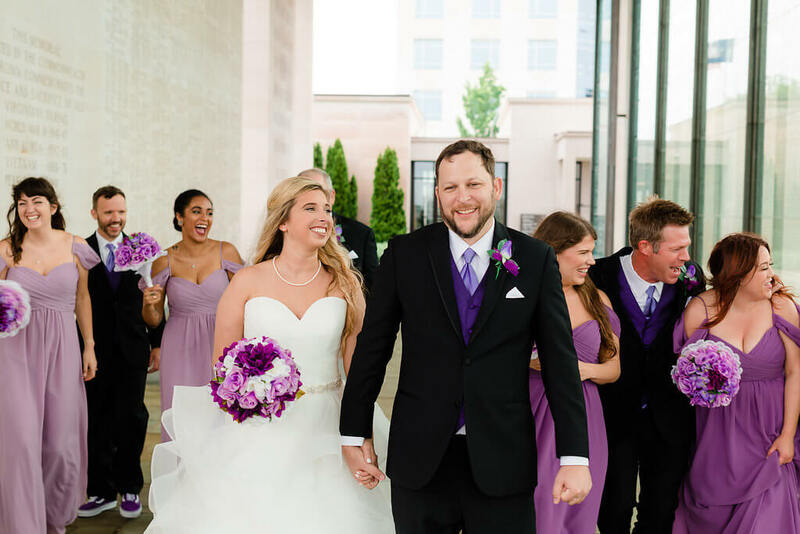 One night they met their friends at Commanders Palace and sat next to the huge windows, watching the storm brew. 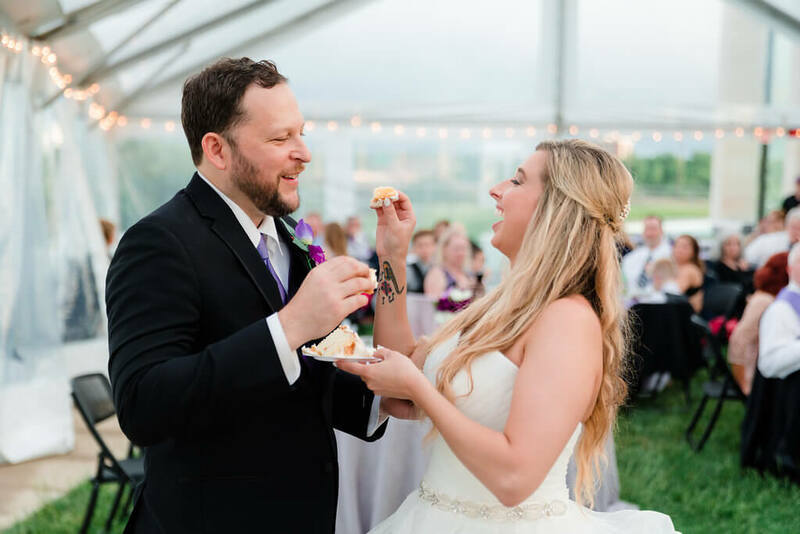 “After our appetizers, the waitress came by with a note and left it on the table, it had my name on it. 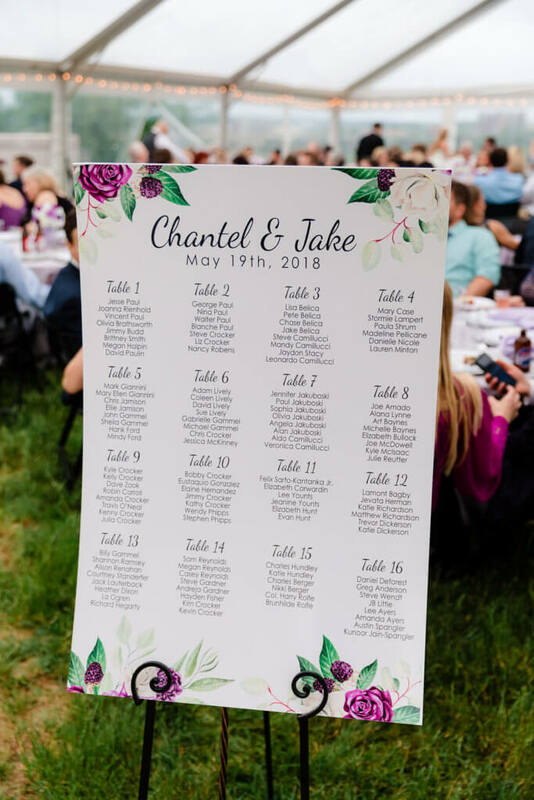 I thought it was a card for our anniversary.” As Chantel was reading the note, Jake had gotten down on one knee, barely getting the proposal out because he was so emotional. 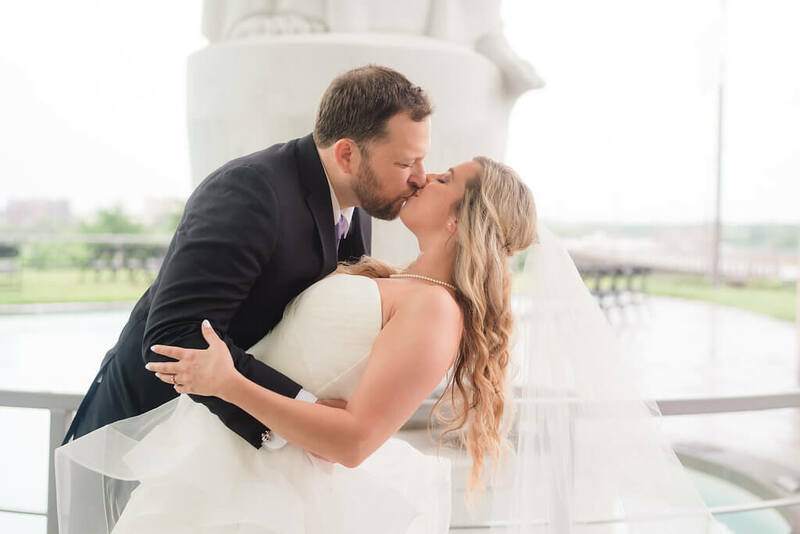 “I lost it too, I was so happy I felt like I was in a dream!” Chantel said yes, cementing the memory of that dark and stormy night in New Orleans permanently in their hearts and minds. 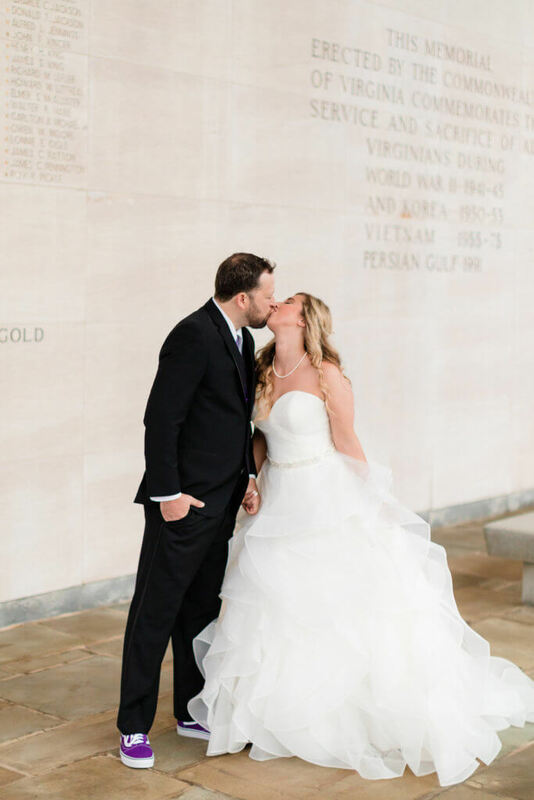 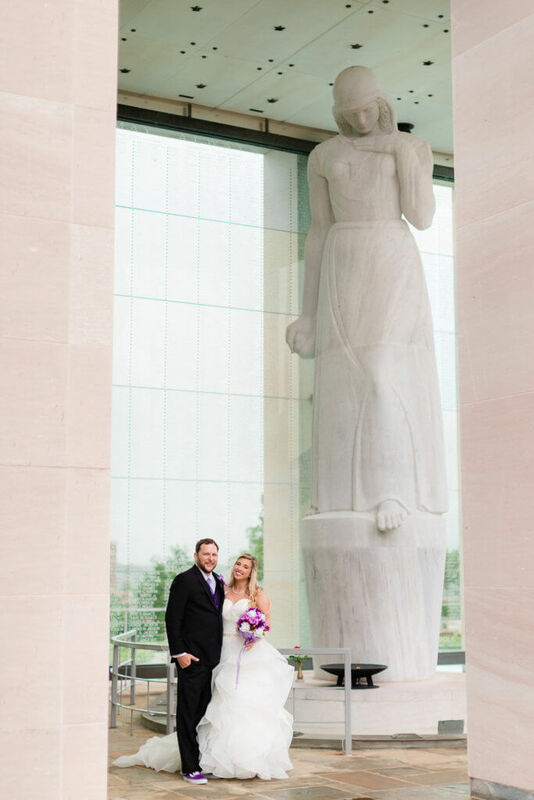 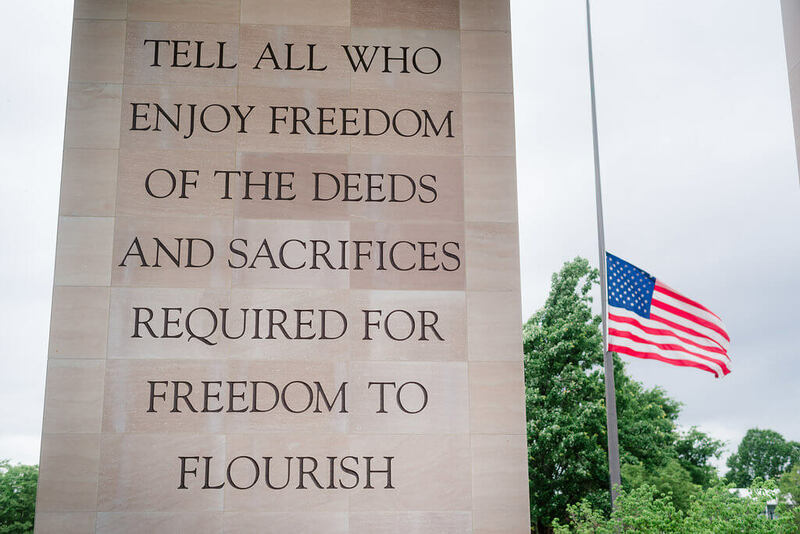 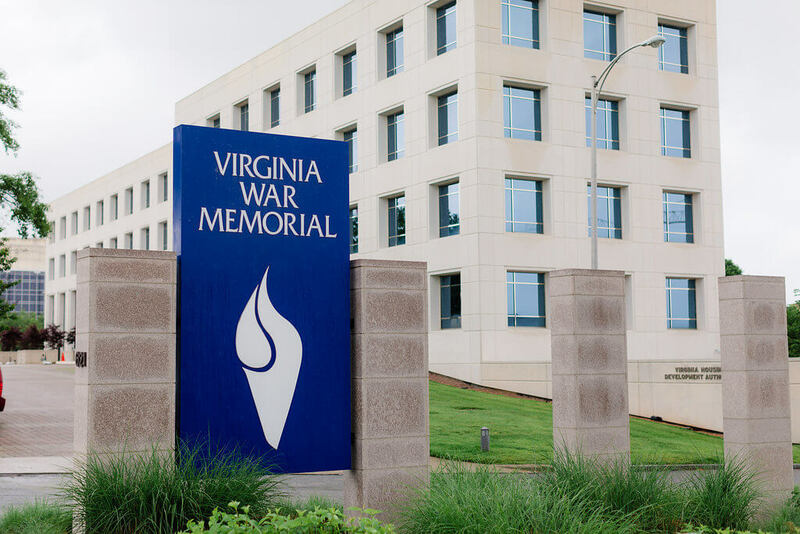 “We picked the Virginia War Memorial because it is stunning! 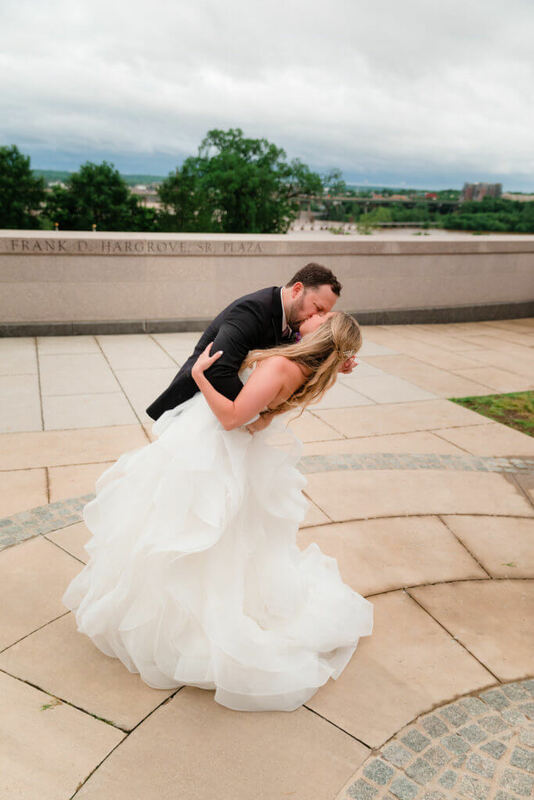 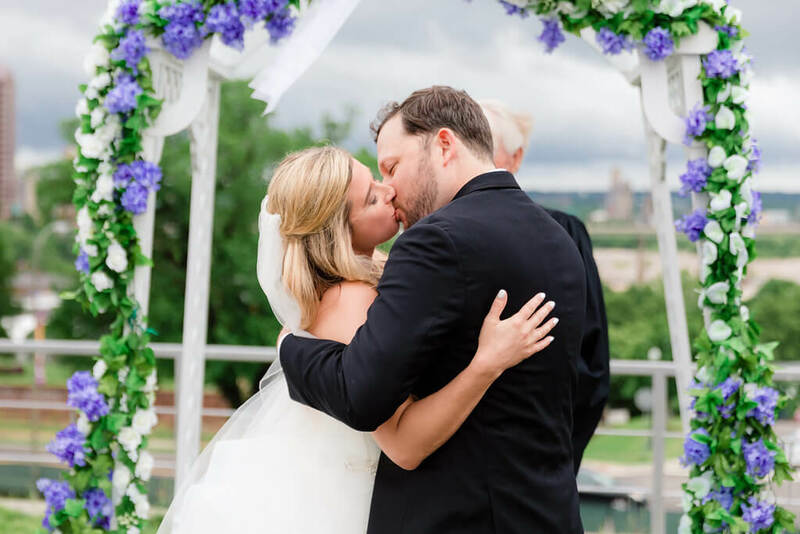 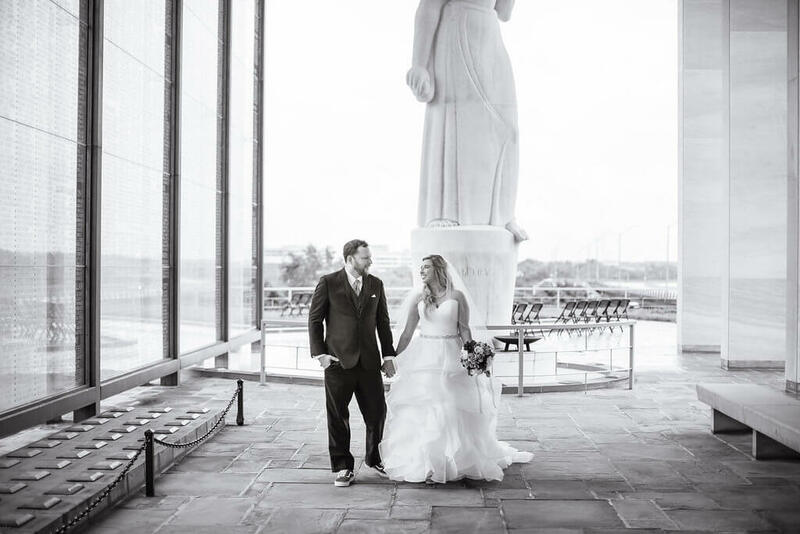 You have the great city views and the river in the background.” It was the ideal combination of their passion for history, as well as showcasing the city they both love. 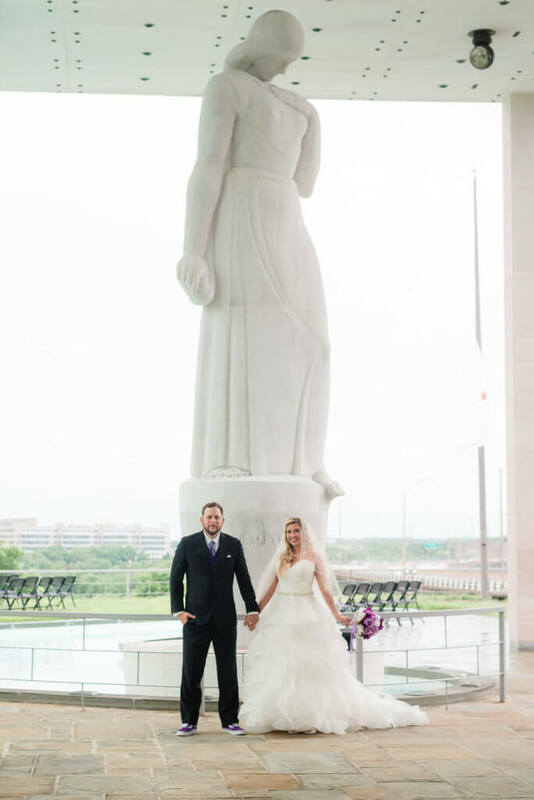 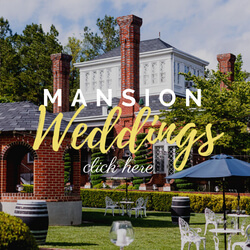 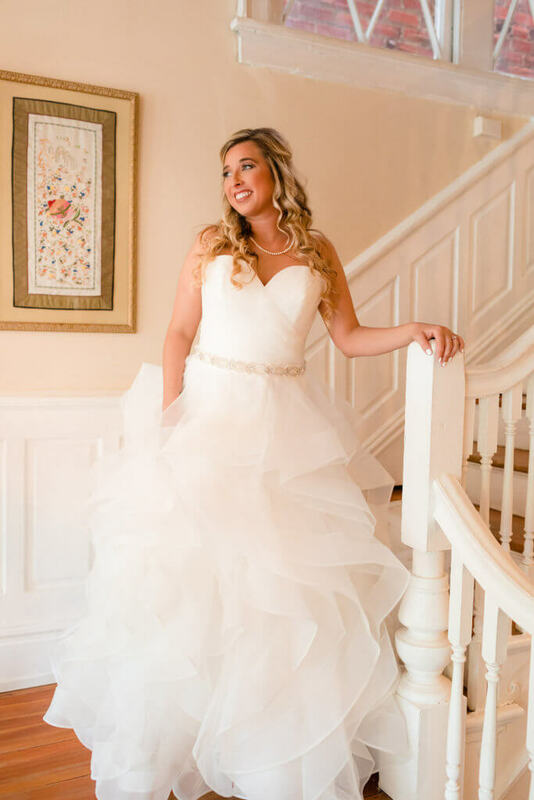 They wanted an elegant look for their big day, highlighting the beautiful scenery of their unique venue. 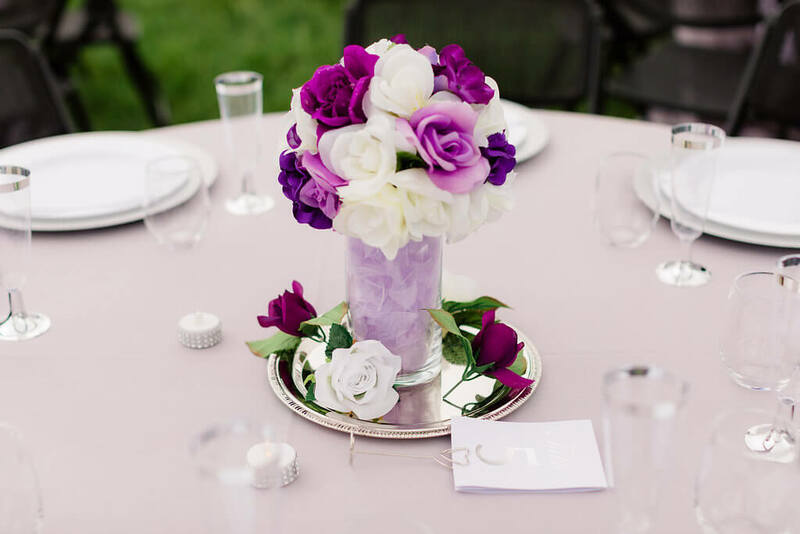 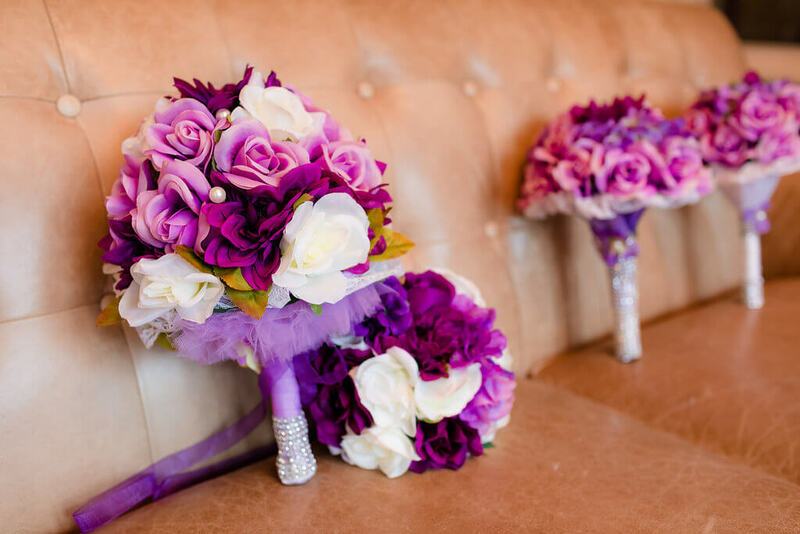 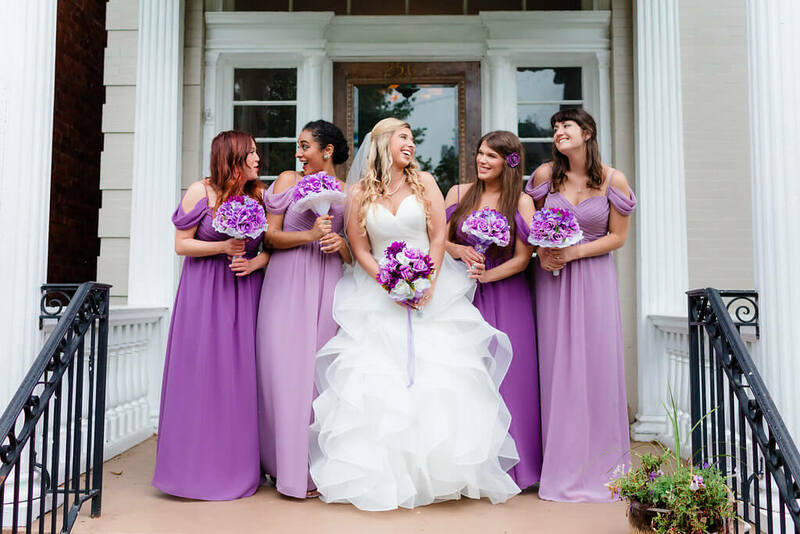 “We wanted pops of purple everywhere! 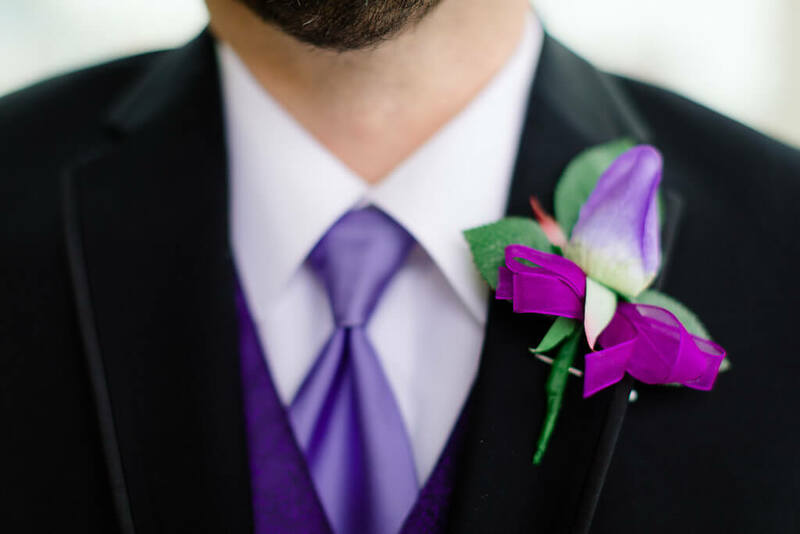 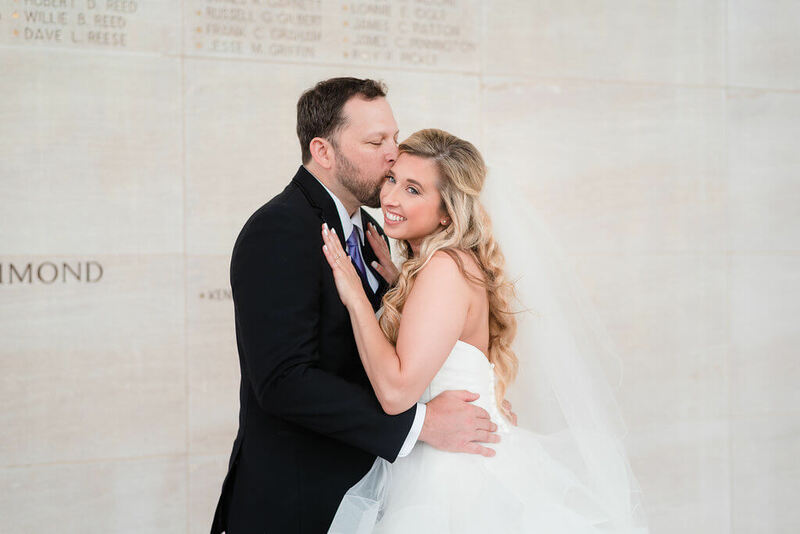 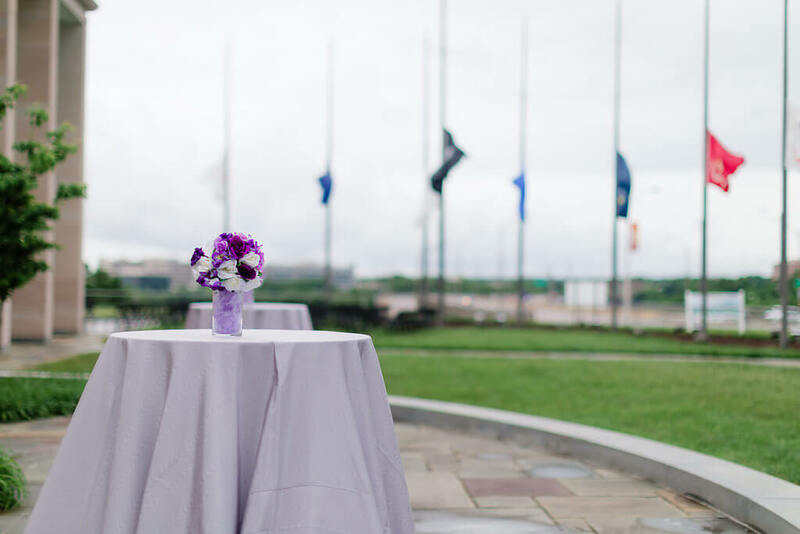 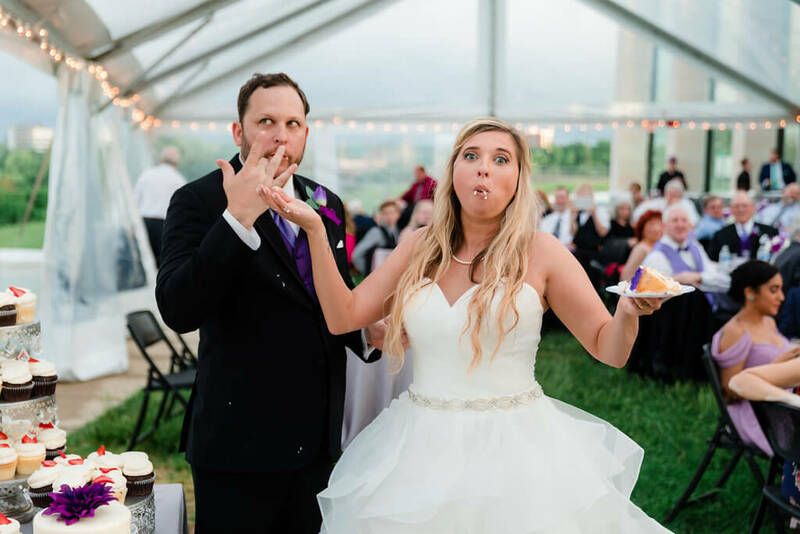 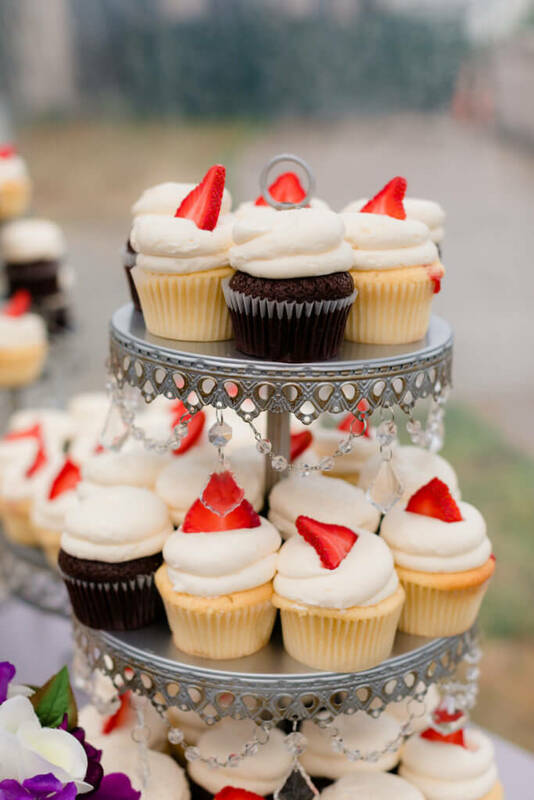 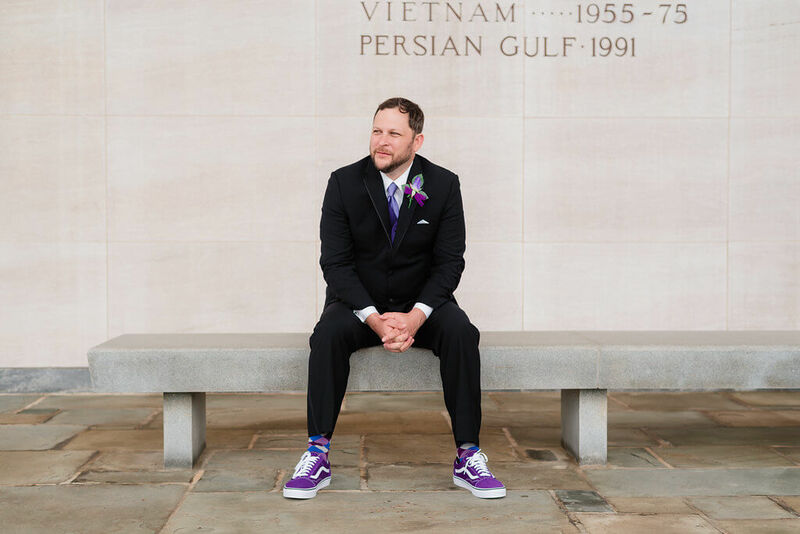 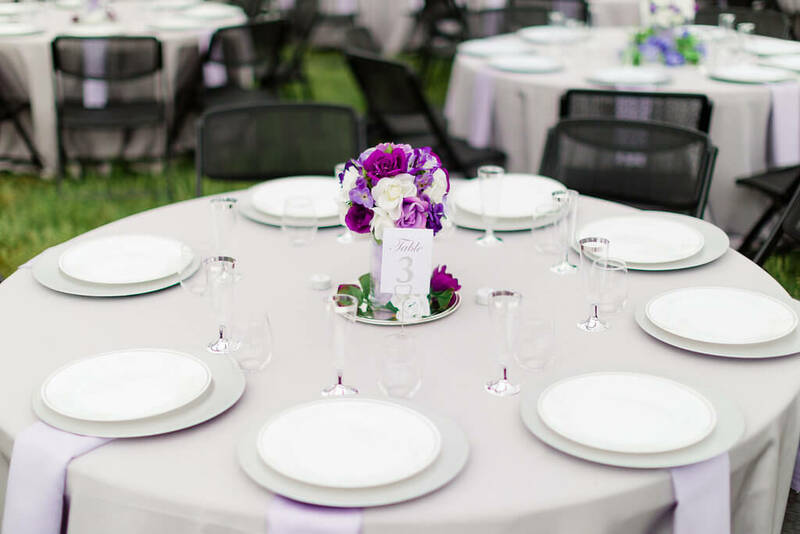 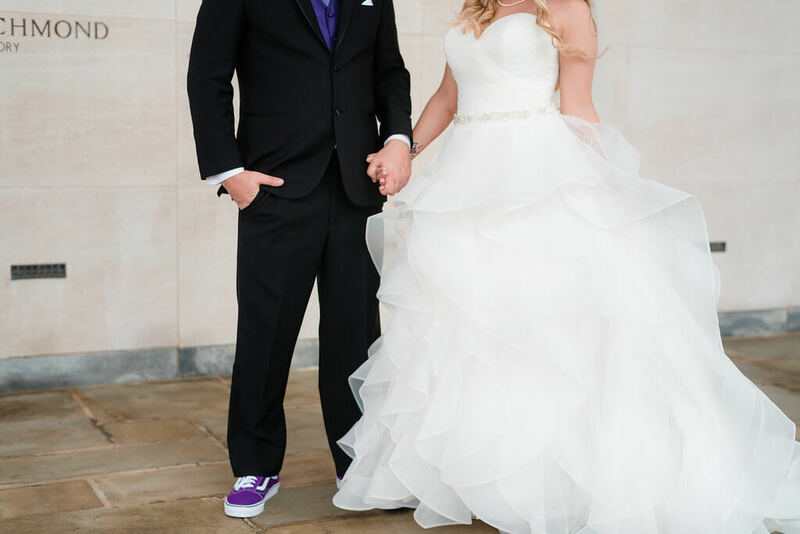 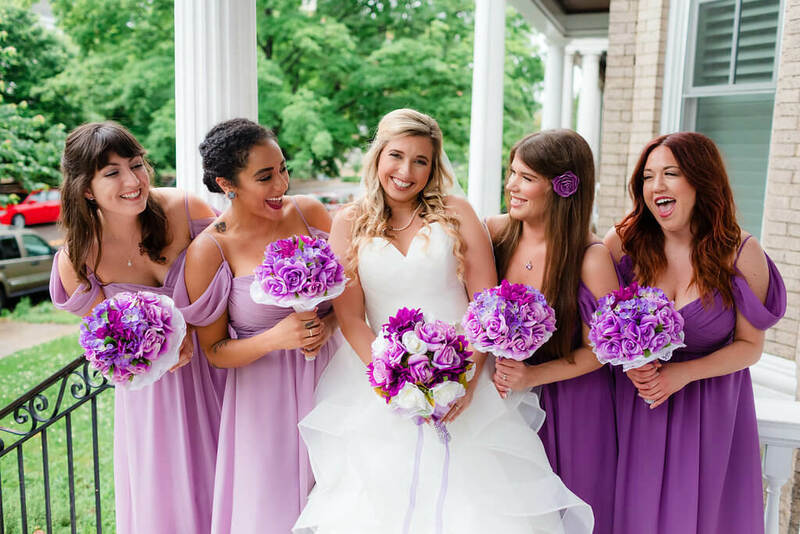 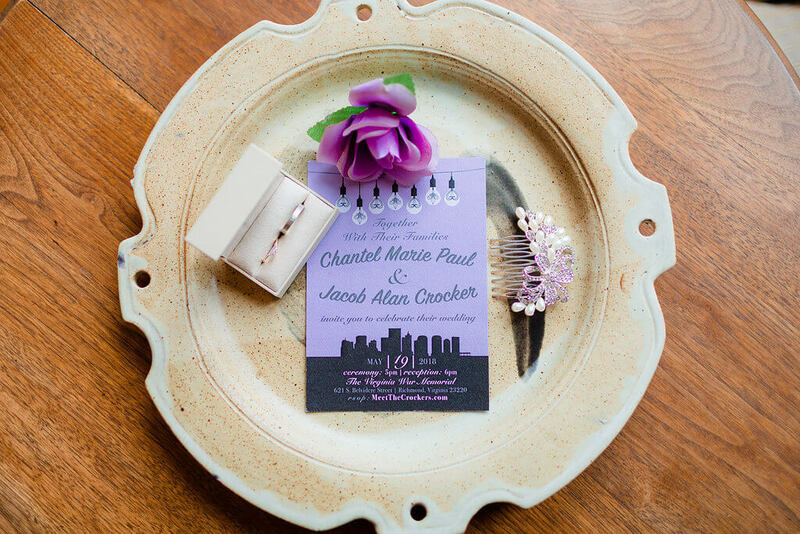 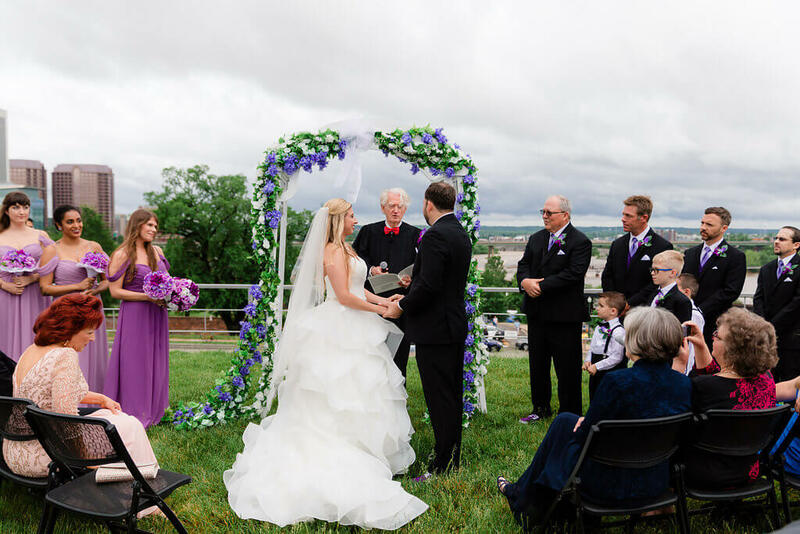 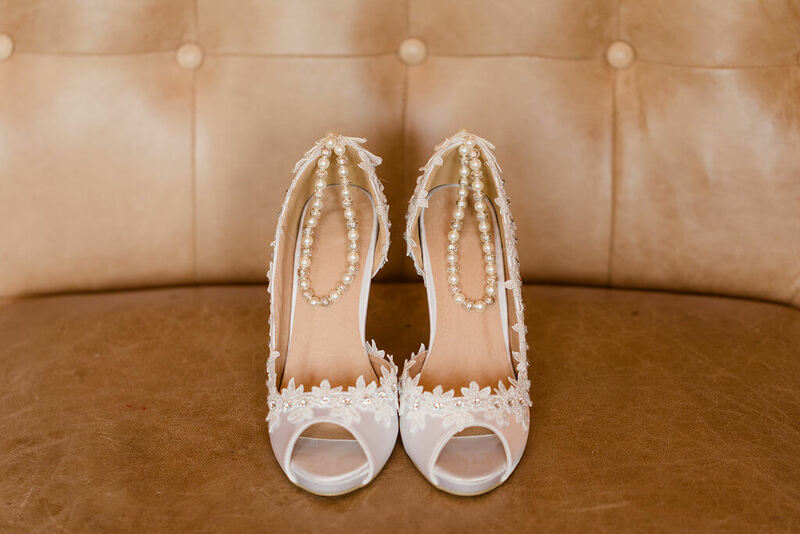 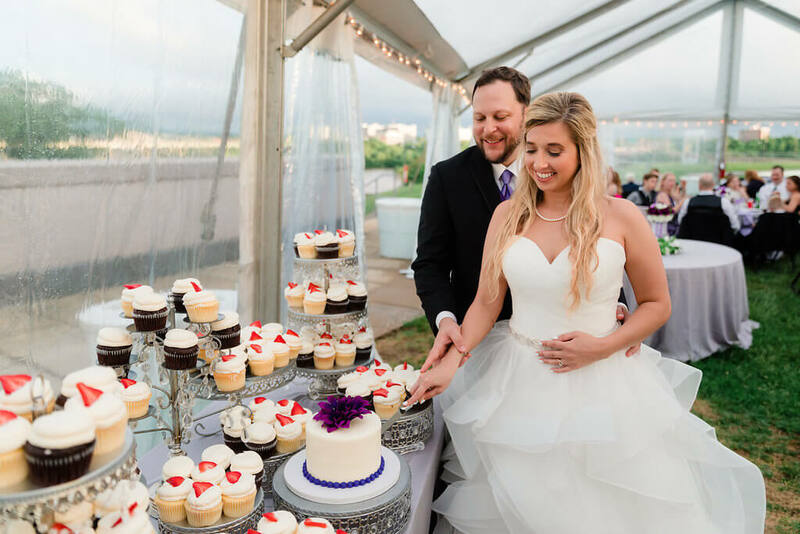 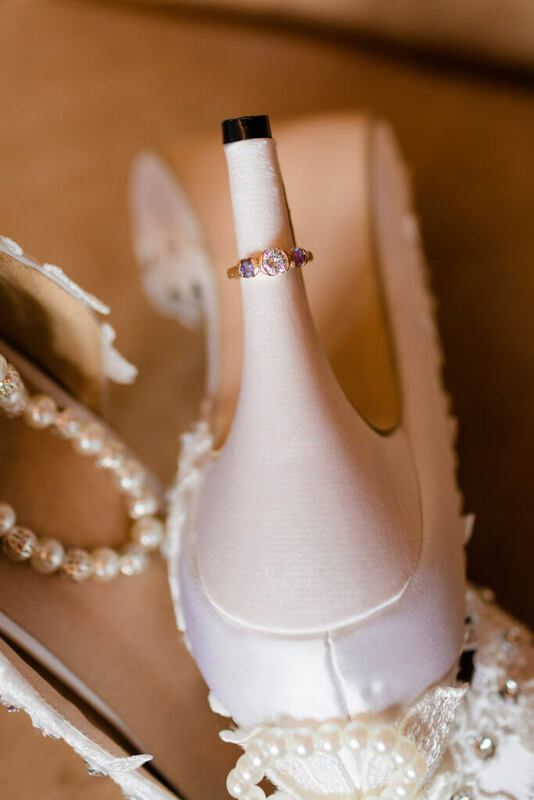 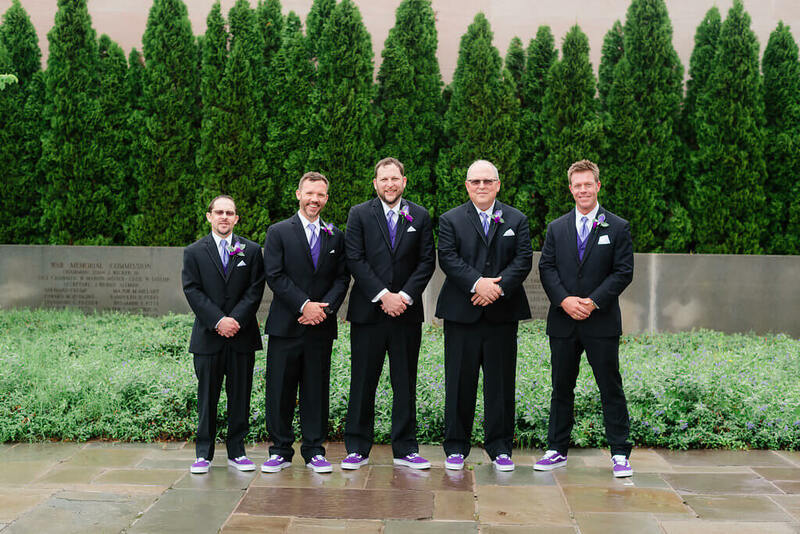 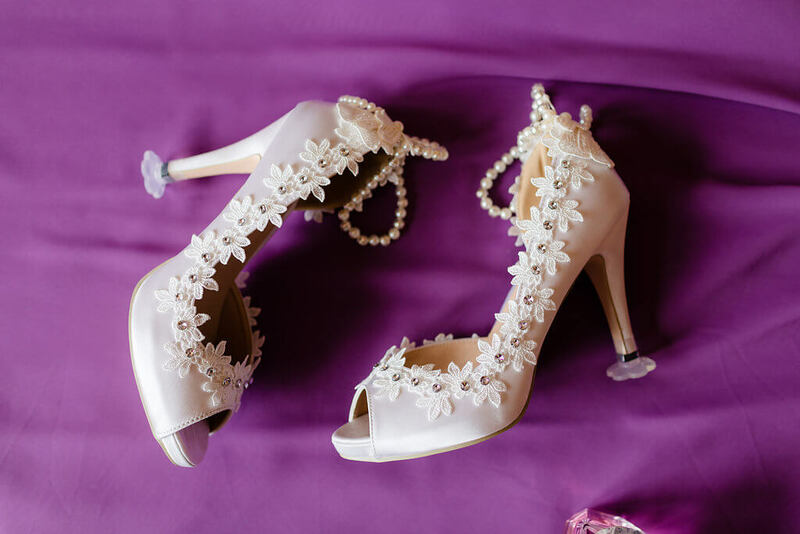 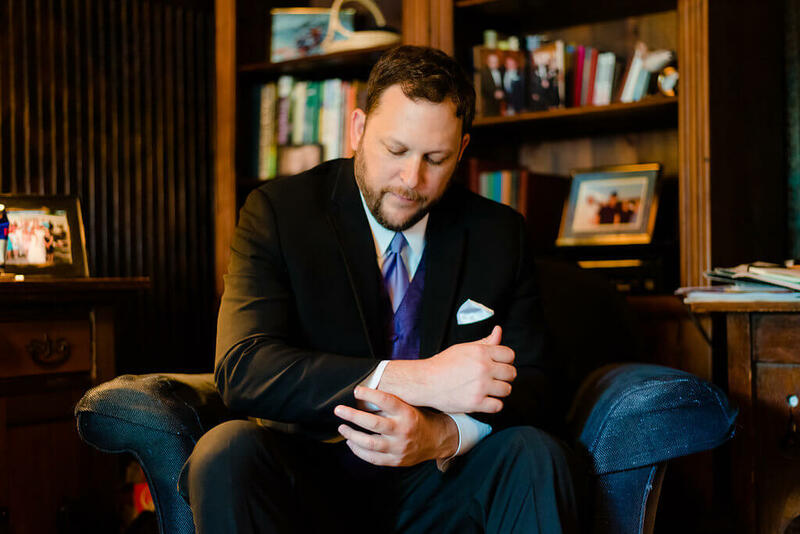 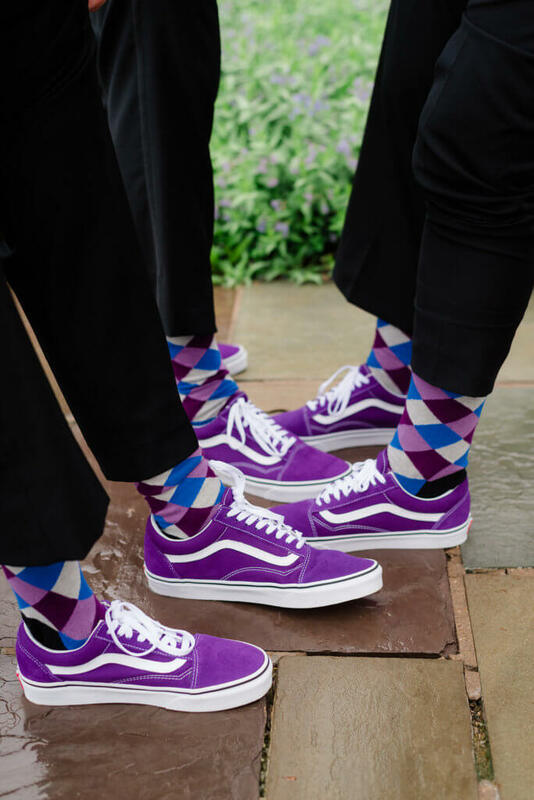 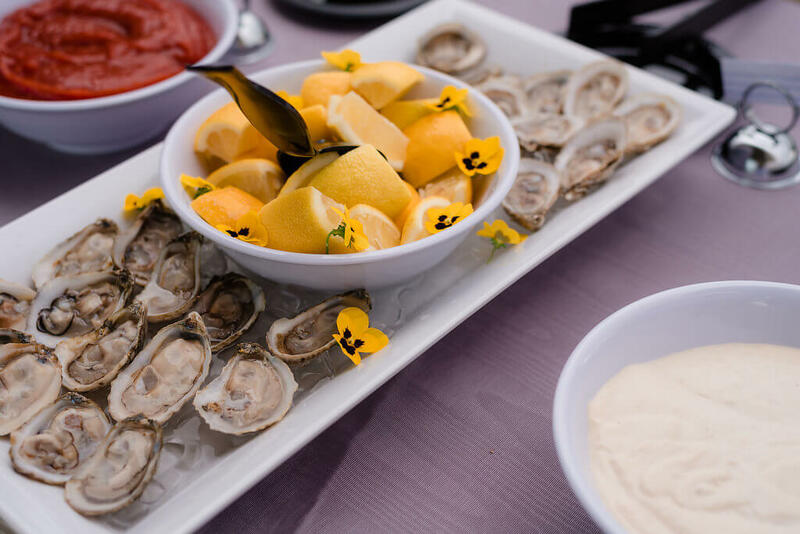 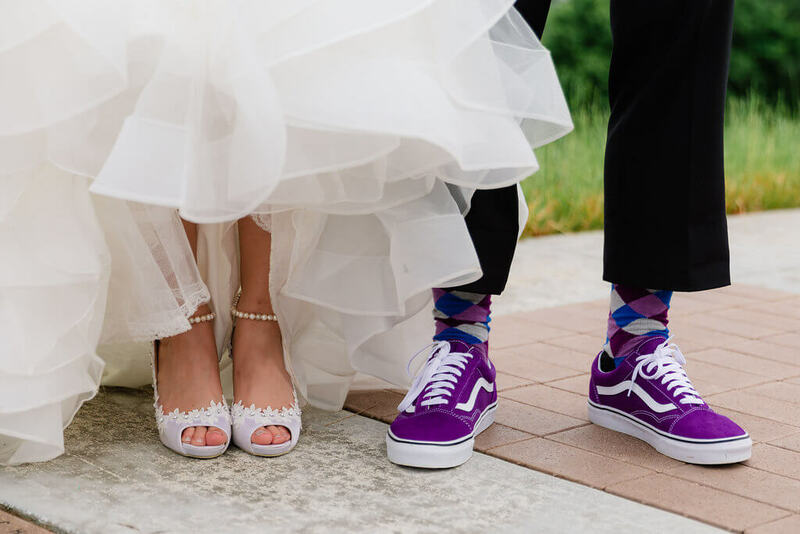 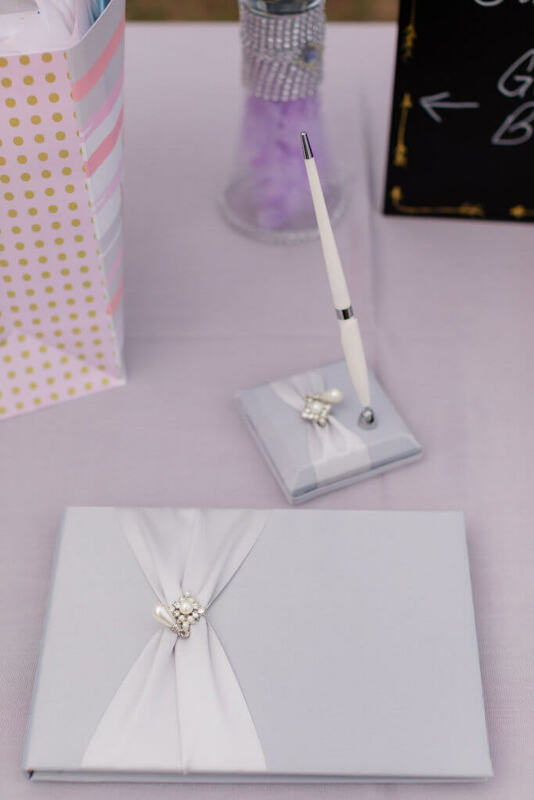 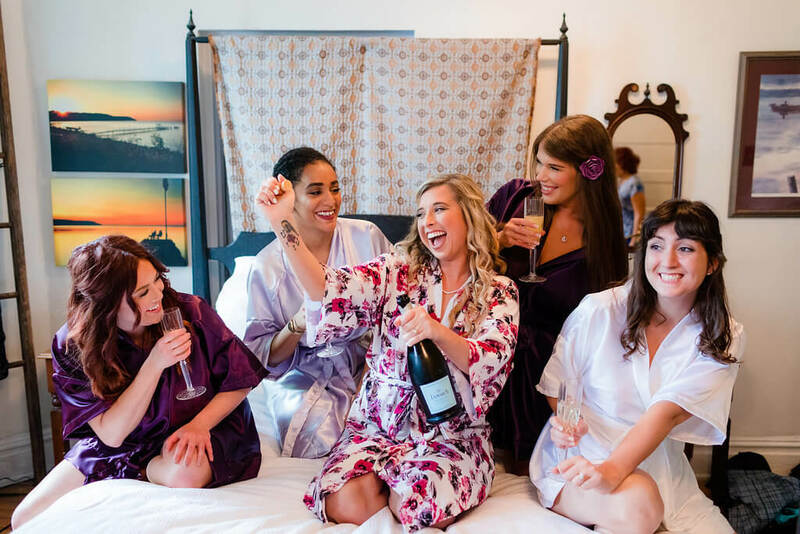 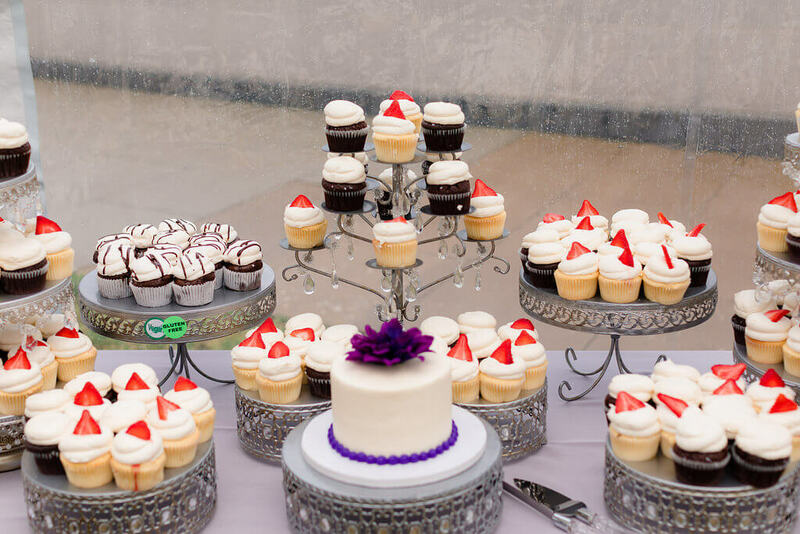 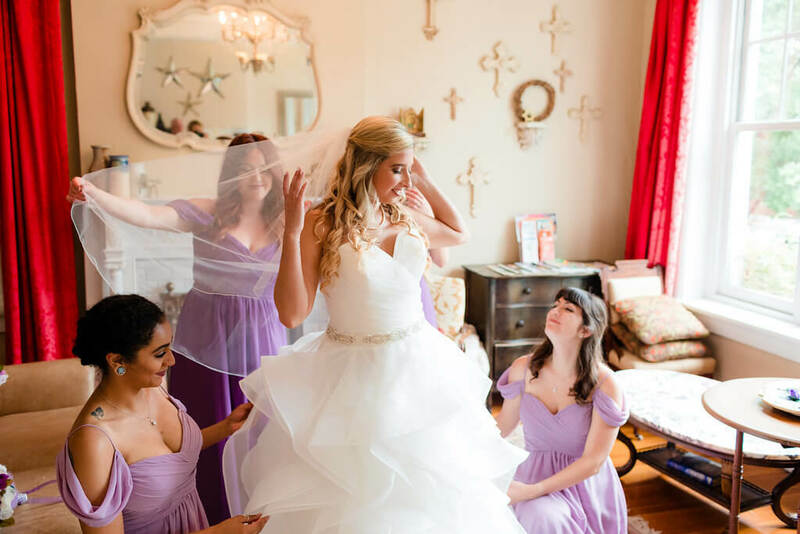 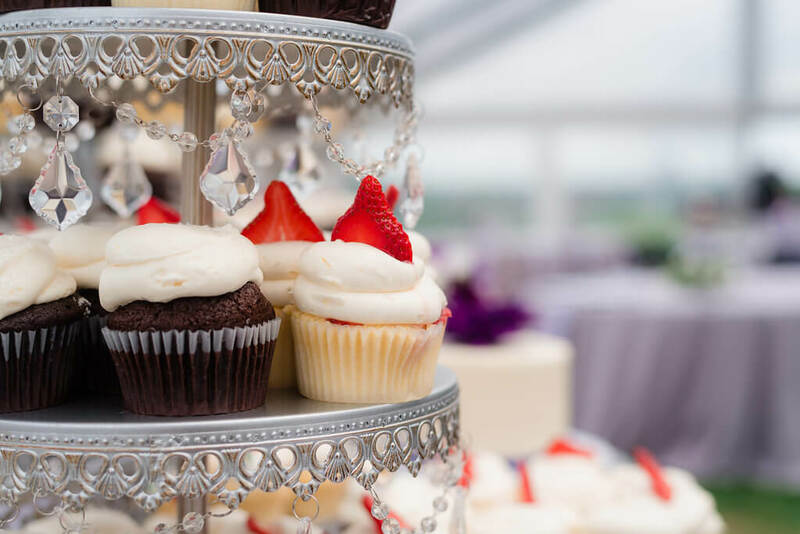 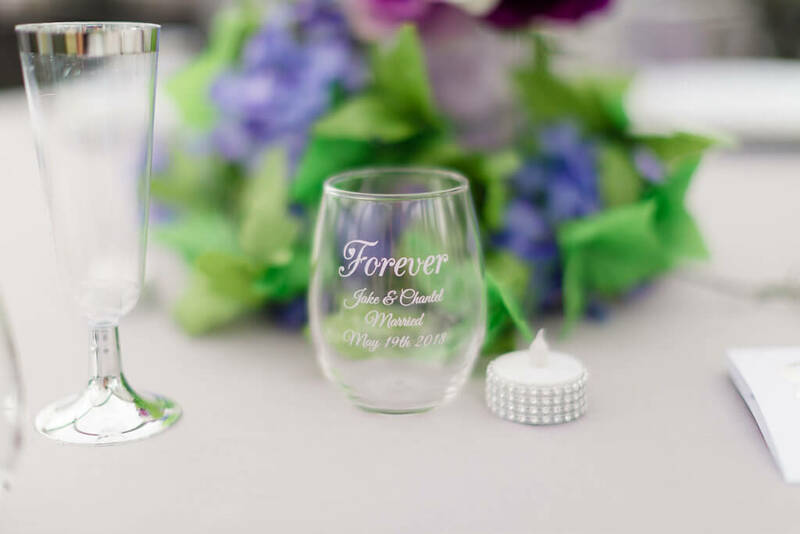 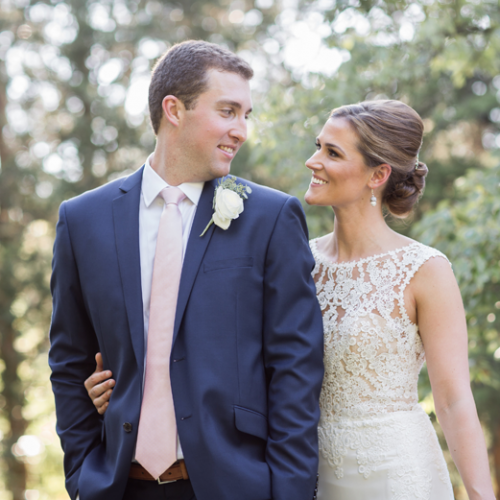 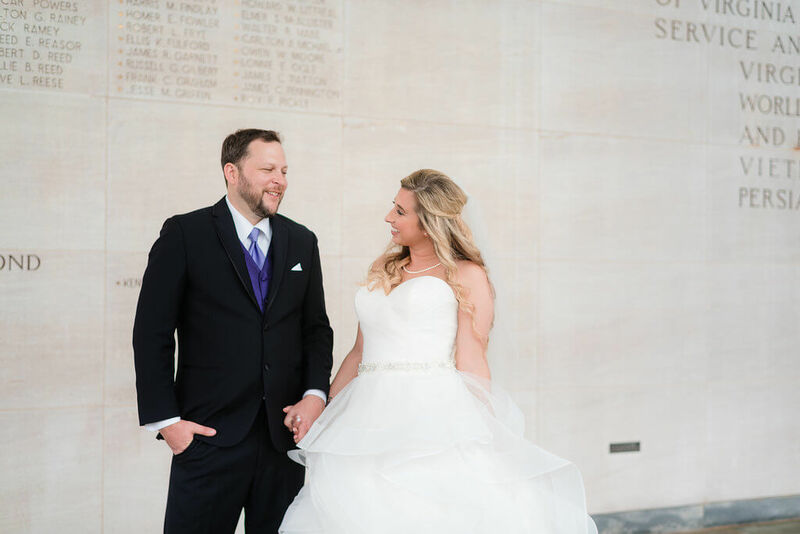 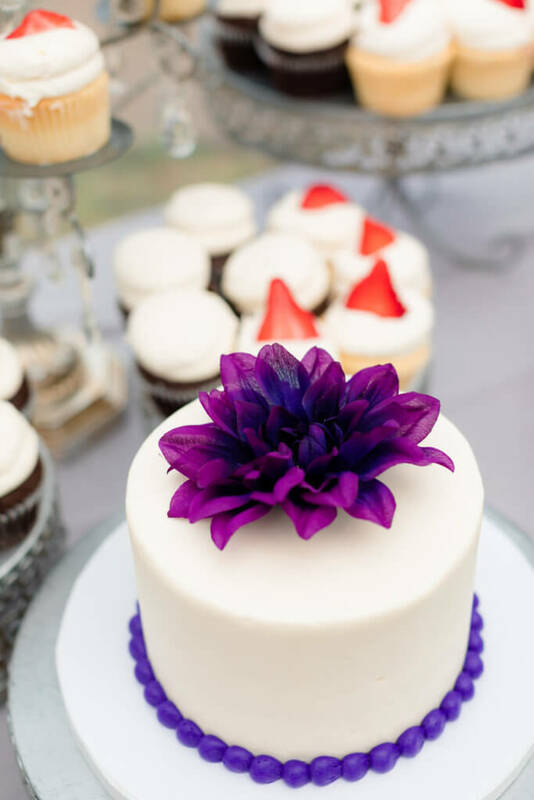 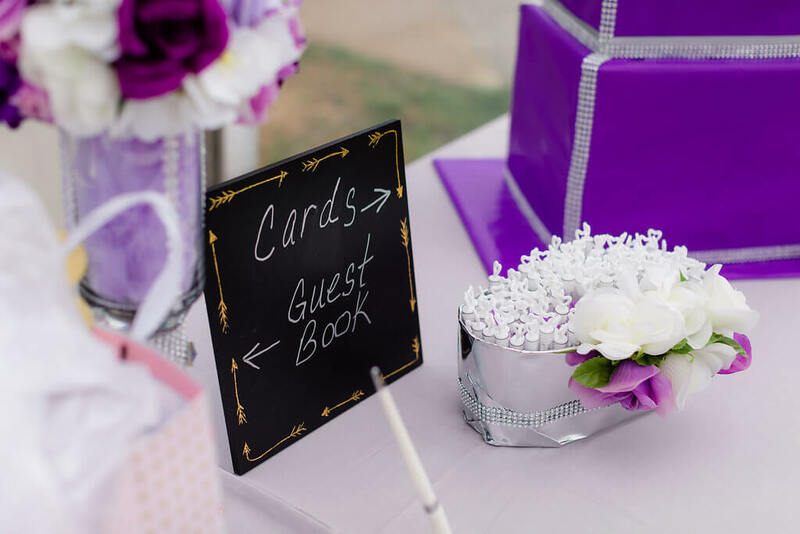 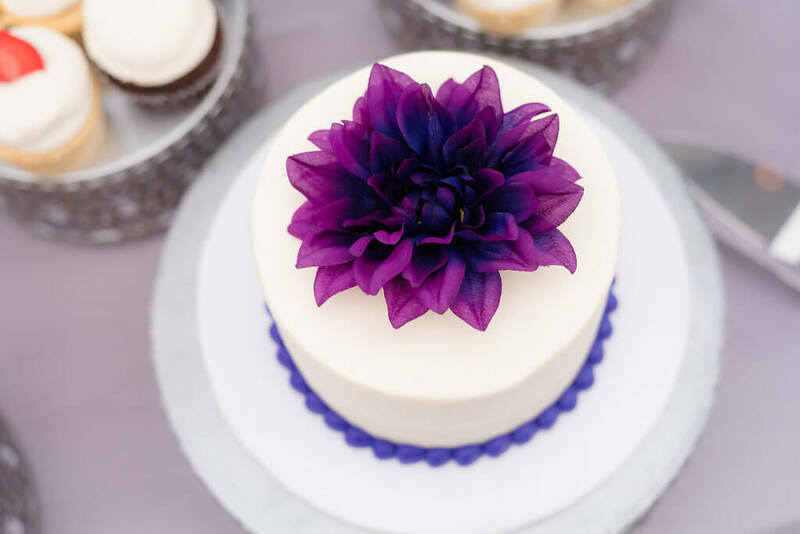 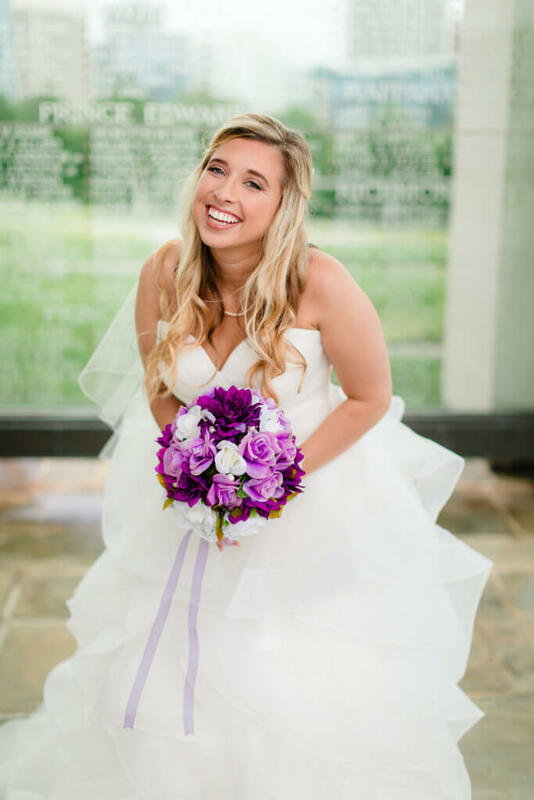 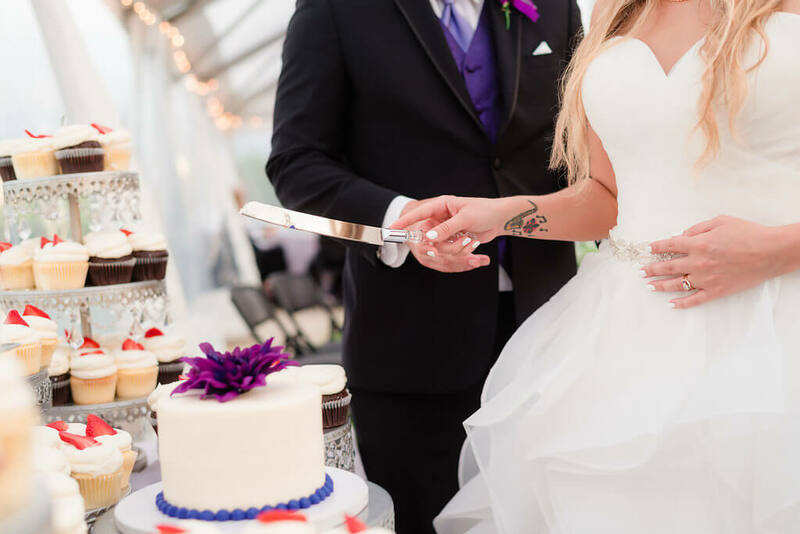 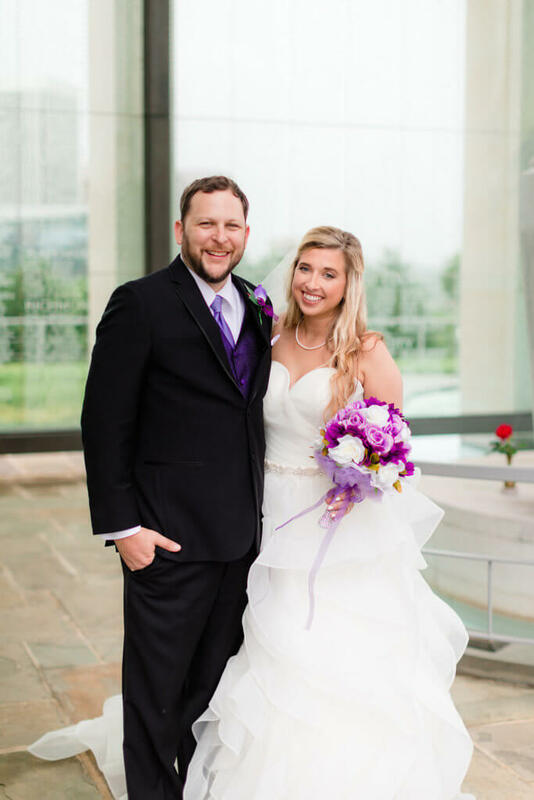 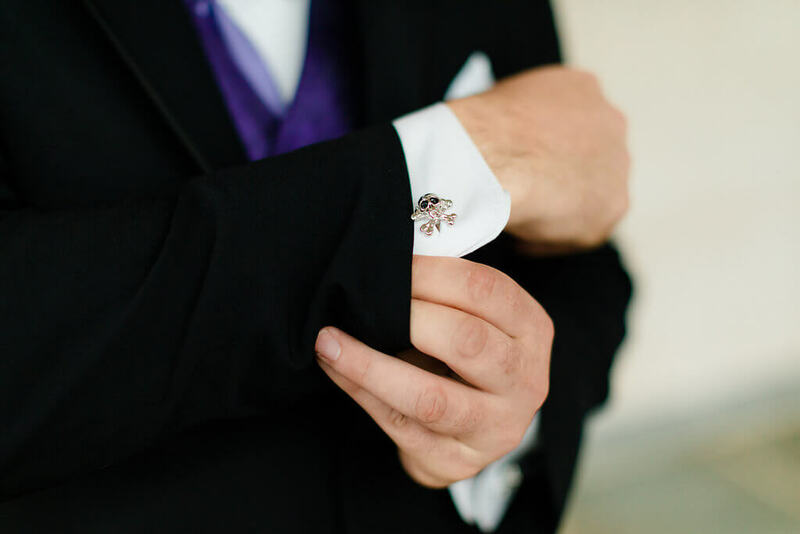 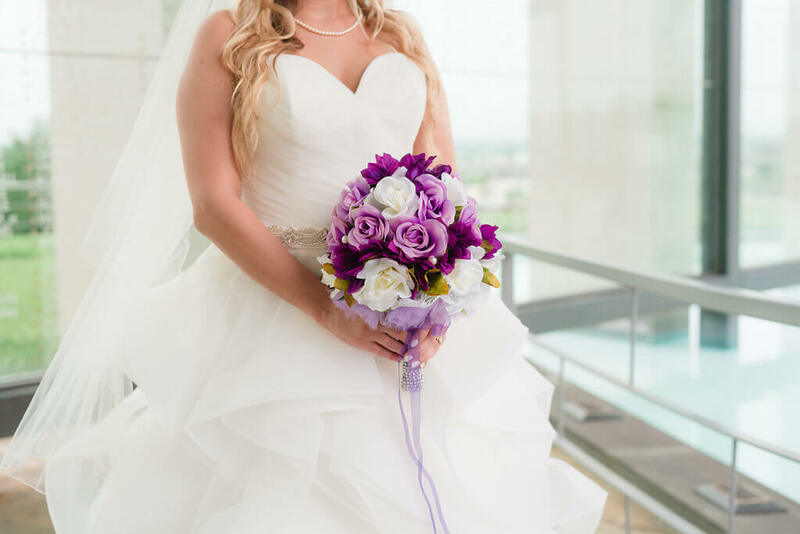 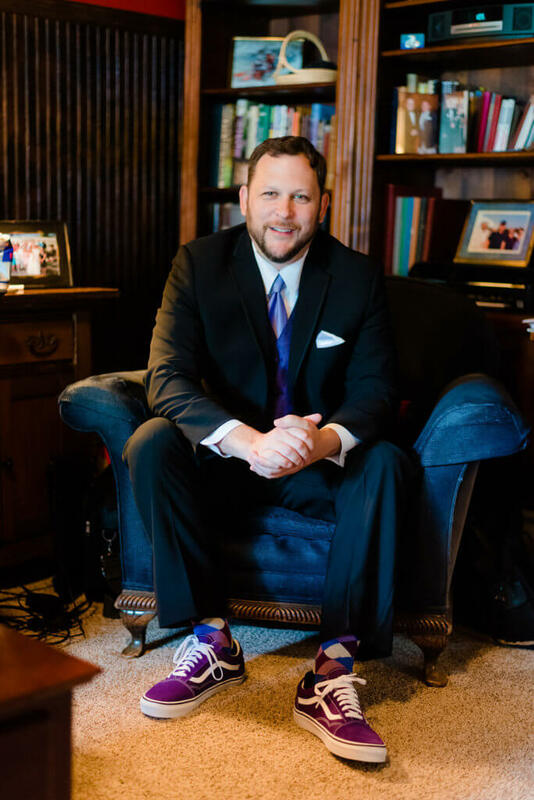 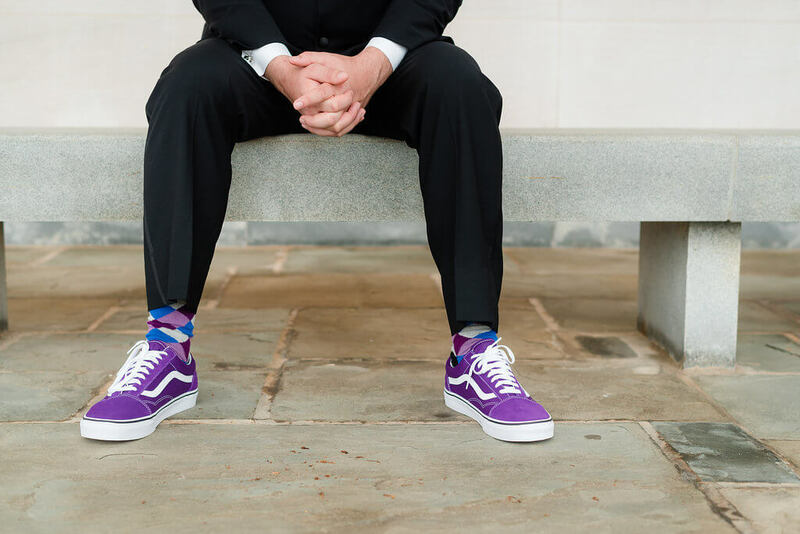 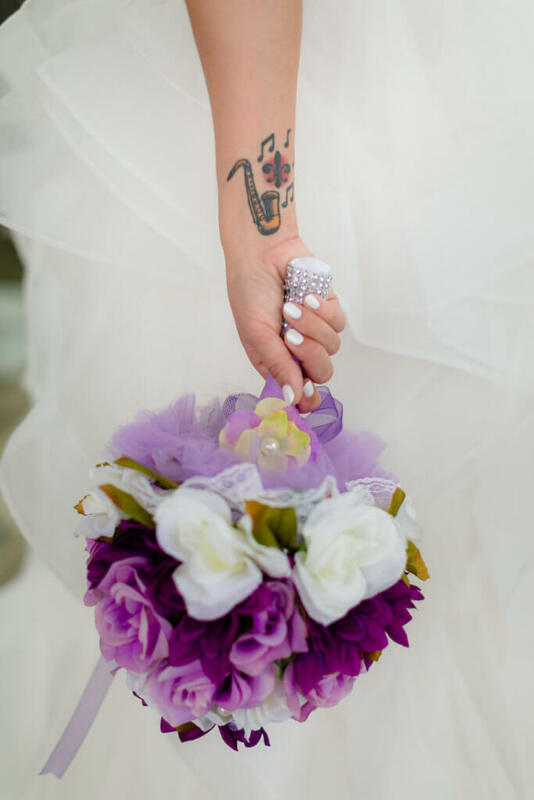 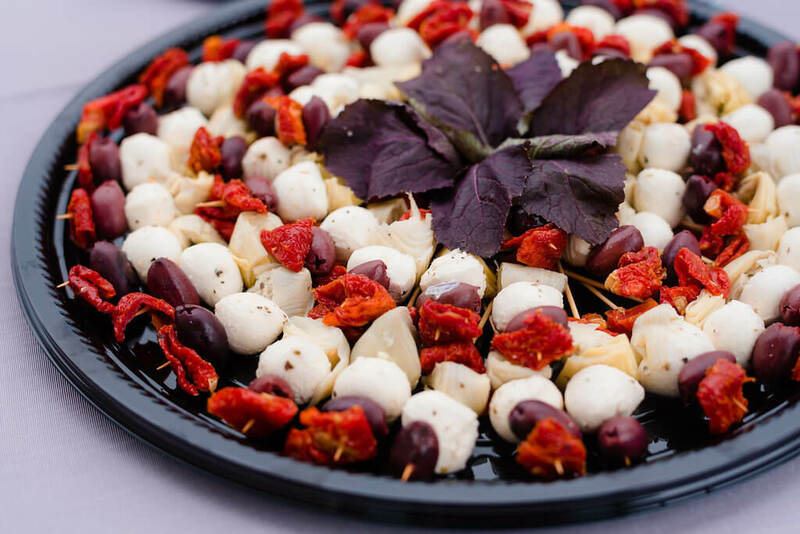 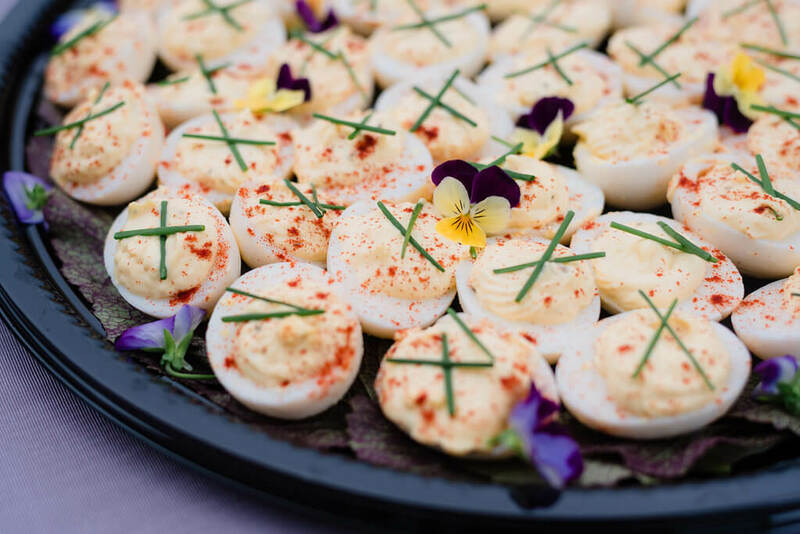 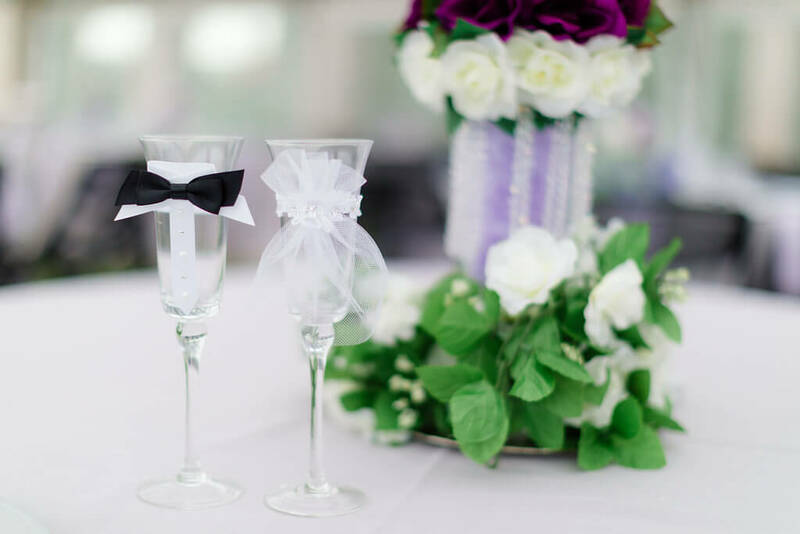 Purple is the color of Lady N’awlins, and it reminds us of New Orleans and is just the color of us.” The wedding party looked perfectly purple, the ladies in various shades of lavender, and the guys rocking royal purple vans with their suits.